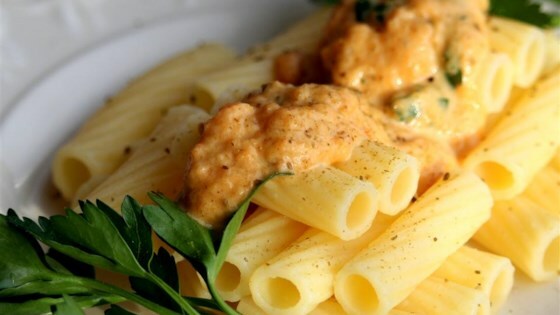 "Pumpkin puree with a light spicy flavor adds a unique take on everyday pasta dinner." Melt butter in a large skillet over medium heat; cook and stir green onions and garlic until tender, about 3 minutes. Reduce heat to low and stir in pumpkin puree; cook for 2 minutes. Mix milk, water, salt, cumin, white pepper, and allspice into pumpkin mixture and simmer over low heat until heated through, about 5 minutes. Remove from heat and stir in parsley. I used this sauce over some chocolate pasta I had. Though I probably didn't add enough sugar to the water, so get a sweet pasta, it did give a nice contrast, which regular pasta wouldn't have. Looked better than it tasted. I think my family was being polite. Definitely a nice change from the traditional flavors mixed with pumpkin. The cumin really stands out. Thank you for the recipe.